1) Idumban placed the hill here and unable to take it back because of Murugan's presence in the hill. Till today Idumban is considered as god and there is a small mountain temple built for Idumban near Palani Murugan temple. 2) This could be the most heard legend in TamilNadu, when Vinayakar came around Sivan and Parvathi to get the divine fruit Murugan went around the world as the competition is, come around the world. Vinayakar justified his act saying Siva and Parvathi were the world for him. So the divine fruit was given to Vinayakar, frustrated by this Murugan travelled in anger and stood on today's Palani temple. These are the legends about Palani temple history. There were many tests taken to know the chemical property of Navabashanam statue but surprisingly the PH value is neutral and it is neither acidic or basic. So Bogar is considered to be the most advanced alchemist better than any other chemist till today. 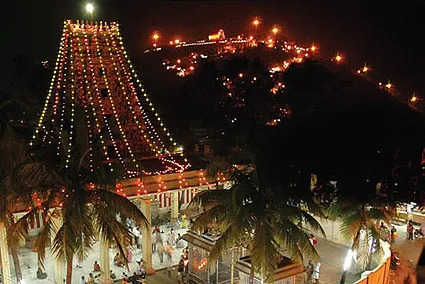 Palani Panchamirtham and Thinai Maavu are the most famous eateries of Palanimurugan temple. This video Panchamirtham info will show the speciality of Panchamirtham in detail. Now Palani Panchamirtham can be ordered through online and get it delivered at our door steps, this is the best example for how things are made more accessible with technology. years old. On top of Palani Malai Kovil(Mountain temple) in Bogar Sannadhi they still have the Maragadha lingam which is said to be worshipped by Bogar. They also have materials saying those used by Bogar and it is showcased to all. So what we know so far about history of palani temple is from legends and a scientific study about the placeis yet to be made. Which would definitely bring many surprises. NativeSpecial.com's mission is to bring our own TamilNadu specialities to lime light and document as much information as we can.